Stars including U2's Bono have paid tribute to Joe Strummer, who has died of a suspected heart attack aged 50. Bono led the tributes saying: "The Clash was the greatest rock band. They wrote the rule book for U2. Bob Geldof: Strummer's legacy was "imperishable"
Bob Geldof told BBC News 24: "He was a clear contemporary and we were rivals. I believed we had to get inside the pop culture - he believed you should aways stay outside and hurl things at it. We had endless arguments about it. "As we all got older I realised what a nice person he was. He was a very important musician. "The Clash will be endlessly influential. They will always be one of the deathless rock bands. "If they can influence people especially in this age of manufactured pop music then God bless him, he's left something imperishable." 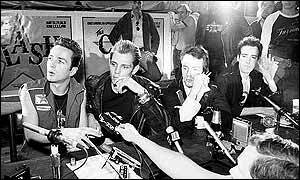 The Clash were a major influence on the Manic Street Preachers. The band's bassist Nicky Wire said: "We're shocked and saddened to hear of the sad loss, especially at this time of year. Our thoughts are with his family and friends." Left-wing singer Billy Bragg told BBC News 24 the band made him aware of politics after he saw them aged 17. "I met him a few times after I became well-known, and we did a few shows together. I had great admiration for the man. "Within The Clash, Joe was the political engine of the band, and without Joe there's no political Clash and without The Clash the whole political edge of punk would have been severely dulled." UK comedian Phill Jupitus e-mailed BBC News Online to say: "In a business populated by self-serving dullards he shone out like a diamond. "I feel privileged to have met him a few times... my thoughts are with Luce, the kids and his close family and friends. I'm going to sit down and play Sandinista. Adios amigo." Pete Jenner, the manager of The Clash during their heyday, told BBC News Online: "It's a huge loss. "The band were one of the best live bands, as good as any band I've ever worked with. My overriding memory of him and The Clash was that it was never boring." Hein van der Ray, the head of Epitaph Records, who released Strummer's two most recent albums with The Mescaleros, said: "It is pretty devastating news." "He had a clear and palpable intelligence"
"He walked it like he talked it"